Echinacea is one of the world’s most popular herbal supplements which is especially useful during the cold or flu season. Also known as Purple Coneflower, it has been used for centuries by native Americans. Today, several species of the plant are used to make medicine with excellent immune boosting properties. Archaeologists have discovered evidence that the native Americans have been using Echinacea for over four centuries as a natural cure-all. Specifically, it has been used to treat serious illnesses ranging from scarlet fever and malaria to diphtheria and syphilis. It was very popular prior to the advent of modern antibiotics and then saw a resurgence in popularity especially in Germany where the bulk of modern research into the herb has taken place. Today, its most popular use is to reduce the duration of common seasonal conditions like the flu and cold and to relieve the symptoms including fever, sore throats and coughing. It is often recommended by herbalists to help bolster the immune system and fight a variety of infections. Modern research tells us that the part of the plant used to make medicine can have a very different effect on the body. The roots are a rich source of volatile oils whereas the parts of the plant above the ground contain polysaccharides which help stimulate the immune system. Many of the plant’s chemical components have a significant medicinal value including flavonoids, polysaccharides, inulin and vitamin C.
We already mentioned that the plant has long been valued in Germany where herbal supplements are regulated by a Governmental body. Supplements made with the above ground parts of the Echinacea purpurea species of the plant have been approved in Germany to treat urinary tract infections, respiratory infections, colds and wounds. Unlike modern antibiotics which attack bacteria directly, Echinacea helps the body’s own immune system become more effective and gives us the ability to attack bacteria and viruses ourselves. It basically increases the activity of the immune system and increases the number of immune cells giving our body the best possible chance of eliminating pathogens from bacteria to tumors. It can also promote the activity of T-cells, stimulate the growth of new tissue and reduce inflammation making it suitable for wound healing and conditions like arthritis and inflammation of the skin. One of the reasons that Echinacea has become so popular is its ability to stimulate the immune system which helps protect us from common conditions like the flu and cold. Although research results have been inconsistent, there is plenty of evidence that Echinacea can protect us from these common viral conditions and at the very least, reduce the symptoms and the duration of the illnesses. It is generally agreed that Echinacea is more effective if you start taking the supplements immediately after you feel the first symptoms of the cold. Studies show that when people take it as soon as they possibly can, it can help relieve many of the familiar symptoms including runny nose, fever and sore throats. Not only that, but when participants took Echinacea in tea form, it significantly reduced the duration of the sickness. When it comes to its immune system benefits, research tells us that the dose is significant. 10 mg of Echinacea for each kilogram of a person’s body weight appears to be the most effective dose to boost immunity. Because Echinacea can help boost the immune system and boasts excellent anti-inflammatory actions, it is often taken to relieve various respiratory problems. These include sinusitis, diphtheria, croup, strep throat, whooping cough and tuberculosis. Drinking tea may be sufficient for some of the milder conditions but if your symptoms are more severe, you should opt for a more concentrated supplement. Echinacea was also traditionally used by Native Americans to deal with a broad range of skin complaints including eczema, psoriasis, stings, bites, infections and wound healing. Topical application of Echinacea may also help regenerate the cells because of its antioxidant qualities. The study compared the effects of several species of Echinacea with a common anti-anxiety prescription medication called chlordiazepoxide. While two of the Echinacea species demonstrated some mild anti-anxiety potential, Echinacea angustifolia demonstrated results similar to the drug. Echinacea angustifolia has also been recommended as a natural treatment for ADHD in both children and adults. It seems that low doses are more effective than larger doses which could exacerbate anxiety. Simply drinking a few cups of Echinacea tea may help alleviate your stress and contribute to a good night of sleep. 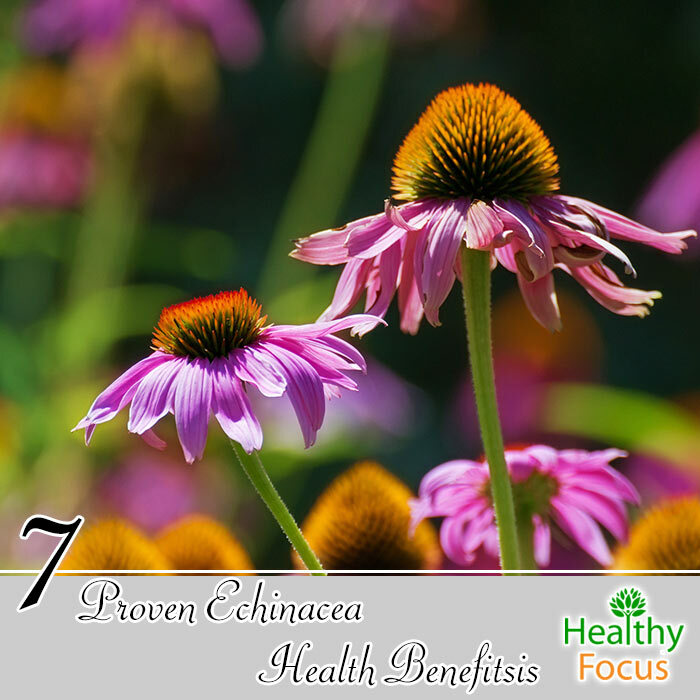 Like so many of nature’s gifts, Echinacea has the power to treat a broad range of nasty infections. Applying a topical remedy made with Echinacea can significantly reduce the recurrence of vaginal infections. It is also able to help treat genital herpes, gum disease, syphilis, urinary tract infections and yeast infections. Inflammation is generally believed to be at the root of many serious diseases including killers like heart disease and cancers. There are many contributory factors to inflammation which include stress and poor sleep patterns as well as environmental and dietary toxins. Fortunately, scientists have discovered that supplementing with Echinacea can help to reverse and treat these damaging effects. There are three species of the herb most commonly used for their medicinal benefits – Echinacea purpurea, Echinacea pallida amd Echinacea angustifolia. Many of the available extracts contain at least two and sometimes all three of the different species. It is available in several different forms including tablets, capsules, tinctures, ointments and dried form for making tea. It is also used as an ingredient in several combination supplements. Make sure that you but your supplements from a reputable source. Unfortunately, studies tell us that many brands of supplement purporting to be Echinacea contain either none of the herb or very little. Many of the labels were misleading or downright fraudulent. Although Echinacea is an herb which has been used safely for centuries, there is still a need to exercise caution. While it is generally believed to be safe, Echinacea taken in very large doses can cause dizziness and nausea especially in people with allergies. When injected, Echinacea has caused some serious reactions including diarrhea, dry mouth, insomnia, fatigue, headache vomiting and muscle pain. Pregnant women and nursing mothers should exercise caution before using the herb. If you are concerned in any way, either avoid taking Echinacea or consult your doctor in advance.